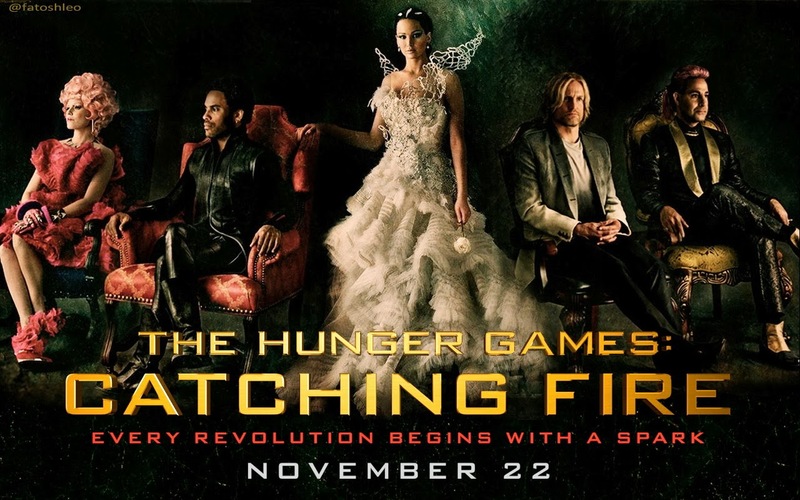 The Hunger Games: Catching Fire is the sequel to last year's The Hunger Games, and for those of you looking for a quick, cut-and-dry answer, I think everything here is at least as good if not better than the original. Most of it, actually, is significantly better. Maybe this is because both the writer and director changed along with some of the production staff, or maybe they succeeded thanks to being given more artistic freedom after the success of the first film. I'm not here to tell you why it was better, I'm here to tell you how it was better. The movie runs just under two and a half hours long, and when it ends you'll still want more. Oh, and for anyone who cares, no, I have not read the books. Part of the excitement of this sequel comes from the simple fact that the previous film needed to occupy itself with establishing everything, and now that we know who's who and what's what we can actually get down into the depths of the story. 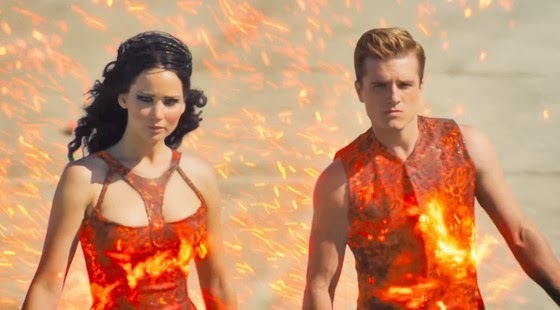 After Katniss Everdeen and Peeta Mellark won the 74th Hunger Games, everything changed. People began to hope for a future where their lives weren't so miserable, where they weren't so oppressed by the upper class of Panem. This is a problem for President Snow, who doesn't intend to let anything about the status quo change, so he and the new game master Plutarch Heavensbee devise a wrinkle for the 75th Hunger Games. This year, the competitors will be chosen from the existing pool of previous victors. This year, everyone in the Games is an experienced killer. 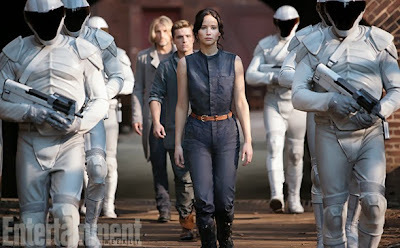 And while Katniss struggles for her life, she must also constantly keep in mind who the real enemy is. Bad CGI flames not quite so bad this time. So let's start with the things which are just "maybe a little bit better" and work our way up from there. The production design is still epic. The sets are gorgeous even in the poor districts where all the color is washed out and the buildings are run-down. The costumes and make-up are fantastic, and the contrast between those in the Capitol and those in the lower districts offers a class critique all by itself. People in the Capitol have bright, vibrant colors and elaborate dressing styles whereas the citizens of the districts are limited to grays and browns and much more simplistic clothing. There's a big improvement in the character development this time around. This may seem obvious because we have the previous movie's foundation to build on, but it would have been just as easy to stop there and leave the characters as they were. Catching Fire exhibits characters changing, maturing and showing broader emotional ranges within what we already knew. Effie Trinket is especially notable in this regard. In the first movie, she was little more than an empty-headed scatterbrain who bought into the ideology of the Capitol completely. Here she shows that she cares for Katniss and Peeta, and this makes the scenes where she shows them how to fit into Capitol society more meaningful. Significantly greater feeling of dystopia. There were also two significant improvements in how the love triangle was handled. First, on a simple level of emotional tension, the movie provides both sides of the love story with enough clarity that you'll feel just as conflicted as Katniss herself. Perhaps more importantly is the movie's renewed focus on the fact that she's compelled to pretend to be in love with Peeta for the sake of the cameras. Half of Panem is emotionally invested in the couple's relationship and the other half knows it's a sham they keep up for their own safety, and this gives Katniss and Peeta power over President Snow they don't seem to know they have. It shows how love can be a revolutionary act under the iron fist of fascism, a message the movie shares with classic science fiction from Nineteen Eighty-Four to Do Androids Dream of Electric Sheep. Something bothered me about the first Hunger Games movie taken by itself. That movie offers a clear critique of reality television and televisual media in general as a pacifier to keep the oppressed lower class content as well as a way to divert their anger onto an irrelevant, unimportant enemy. But is this not exactly the same way The Hunger Games itself functions? We see this dystopian dream world with its obvious evil patriarch in the form of President Snow, and we're placated by Katniss's resistance in the same way as the people of Panem. Ought not our response to to this escapist fantasy mirror Katniss refusal to participate in the Hunger Games? And, of course, the necessary transformation. This is where Catching Fire becomes a necessary supplement to the original film. At the beginning of the story, we see the changes that have taken place in the world of Panem and the effect that Katniss's actions have had. In one of the film's most startling and exciting images, Katniss glimpses a mockingjay graffiti in a tunnel on her way to District 11. The lower class districts are rioting, and the Capitol's attempts to tighten its grip on them are failing. Then Katniss is forced to return to the Games, and in them she proves that there is room within the broadcast for resistance. Her actions reverse the message of the first film: the Hunger Games, and by extension the movie industry in general, has some potential for redemption despite its overabundance of escapist fantasy. The possibility for change still exists. Thanks, Wes. In my review, I forgot to mention that the trilogy of books as well as the two movies so far are a commentary on reality TV. I think the first movie works better in this way because there's more cutting back and forth between the arena and the outside world, there's more hints of cameras in the arena. That was my impression. But with the second movie, I felt the reality TV aspect was overlooked, perhaps because too much stuff was happening (with the romance and the politics). And I guess I wanted some satire identical to 'Robocop' or 'Starship Troopers' in terms of hitting you over the head with the silly stuff. That didn't happen with 'Catching Fire' - it was a more inner circle-type movie not that large in scope. What worried me as well was this drawn out lead up to the Quarter Quell - I felt sorry for the non-fans regarding this. The first book starts swiftly, but the second book drags a bit. I expect the non-fans to be up in arms, and I have seen the odd comment that the lead up is immensely boring. I sympathise, even though I can tolerate this lead up. Putting on my objectivity glasses, I see that the romance does come across as pretty dry, dull, boring, whatever. When I truly think about it, I doubt the movie is very exciting for regular moviegoers who haven't read the books. So I found your review somewhat surprisingly, though I'm glad you enjoyed it considerably, like I also did.